What is needlepoint canvas? The terms cross stitch, embroidery and needlepoint are often used interchangeably by people who don't know the distinctions between these arts. While they share similarities in that they all involve a needle and thread used to make a design, there are important differences, and one has to do with the fabric, or canvas, that is used. Needlepoint canvas can be found at most craft stores, but if you are looking for convenience and a large selection then shopping on the Internet is the way to go. There are hundreds of resources for every level of experience just a click away. Jo-Ann Fabric and Crafts carries several types of needlepoint canvas as well as other needlepoint supplies. You can choose to shop at the Internet store or a brick and mortar store in your area. Zweigart offers a variety of needlepoint fabrics in many different sizes. They have several different colors available as well. Alex Paras has several styles and colors of blank needlepoint canvases. They also have kits, painted canvas, and charted needlepoint to supply every type of needlepoint enthusiast. Needlepoint Shop has a selection of canvases. It also offers a great variety of other supplies and resources for the needlepoint hobbyist. Art Needlepoint stocks hundreds of painted canvases for the needlepoint hobbyist who wants something unusual, challenging, and unique. Some of the canvases are copies of famous paintings, while others are unique designs by well known designers. Needlepoint Canvas tends to be larger than the fabric that is routinely used for cross stitching, but that's not always the case. A good basic cross stitching fabric has 12 or 14 stitches (or squares) per inch, while needlepoint canvas ranges from five to 26 stitches per inch. This type of canvas tends to be stiffer than the fabric used for other needle crafts. The separate but related craft known as plastic canvas is a form of needlepoint that uses canvas actually made out of plastic to form rigid shapes. There are three main types of needlepoint canvas available. Mono canvas is the most popular variety in the United States. The squares are made from a single thread that intersects other threads across the canvas, creating squares. There's one crossing on each intersection of the fabric. Many different colors and count sizes are available, and you can purchase it in widths of 40 or 54 inches. Also known as Penelope canvas, duo canvas is the most popular canvas in England. 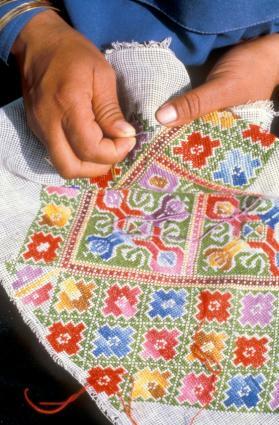 As the name suggests, it uses two threads to make each square, and the stitching can be worked over either one or two threads. This gives the canvas more versatility and allows the stitcher to add more detail in certain sections of the project by making smaller squares. The package usually gives the count size in a way that reflects this ability; a 10-20 count means it has 10 squares per inch if stitched over two threads and 20 if stitched over one thread. Similar to mono canvas, interlock is the lightest and least expensive of the canvases. It uses one thread to make a square, but instead of having the threads intersect, they are actually woven around each other. This canvas is not as strong or durable as the other canvases, and it's not available in the wide range of size counts that the other canvas varieties are. Thus it is considered good for small projects and things that will not be subjected to a lot of wear. Needlepoint canvas can fray, so you might want to put some masking tape on the edges to keep it from unraveling while you're working. If you like extra stability, you can also use a stitching frame to keep the piece firm while you're working. As in cross stitch, it helps if you start from the middle of the pattern and work your way out, changing colors as needed. To find the center of the project, either measure your canvas to find the center point or fold it in half in both directions. The middle corner will be your center point. When you are done stitching you should stretch or block the canvas to make sure that the design is square. An easy way to do this is to spray the canvas with water, use a staple gun or tacks to secure one side to a piece of wood, then gently stretch the fabric square and tack down the other side, top and bottom. Allow it to dry before removing from the board. Then you can frame it, make it into a pillow, or create whatever else you like. No matter what type of canvas or pattern you choose, needlepoint is one way of adding beauty and character to your home's decor. By using a variety of canvases, you can create something for every room in your home.